That’s how ‘The Artistic Cat, Praise, Poems and Paintings,’a miniature book, published in China by Running Press in 1991, describes the beautiful reproductions of paintings and sayings throughout the book. Now you might wonder, why Paws is writing about a book that’s over ten years old. It’s great to write about book that are hot off the press, like Jackson Galaxy’s ‘The Cat Daddy,’ or classics, like the late Cleveland Armory’s, ‘The Cat Who Came for Christmas,’ but everyone once in a while you find another gem in the rough – one that’s just a great read, one that everyone should take a book at. Today, I’m talking about just that, a book that’s a treasure because of its content and because of where it came from. This was a special gift from a special person, not a significant other, but a very special ten-year-old nephew. Last year he attended a holiday bizarre, in search of Christmas gifts for his family. At 10, he wasn’t in a position to go shopping at the big box stores or specialty boutiques. Armed with some dollars in his pocket, he was on a mission: to find gifts for the special people in his life, including his aunt, who absolutely loves cats. He was very proud of his find – an interesting miniature book that I’m adding to my list of reviews during November, a month that celebrates many aspects of books, from children’s books, picture books, specialty books and more. The book is beautifully illustrated as is seen on the cover, pictured here. 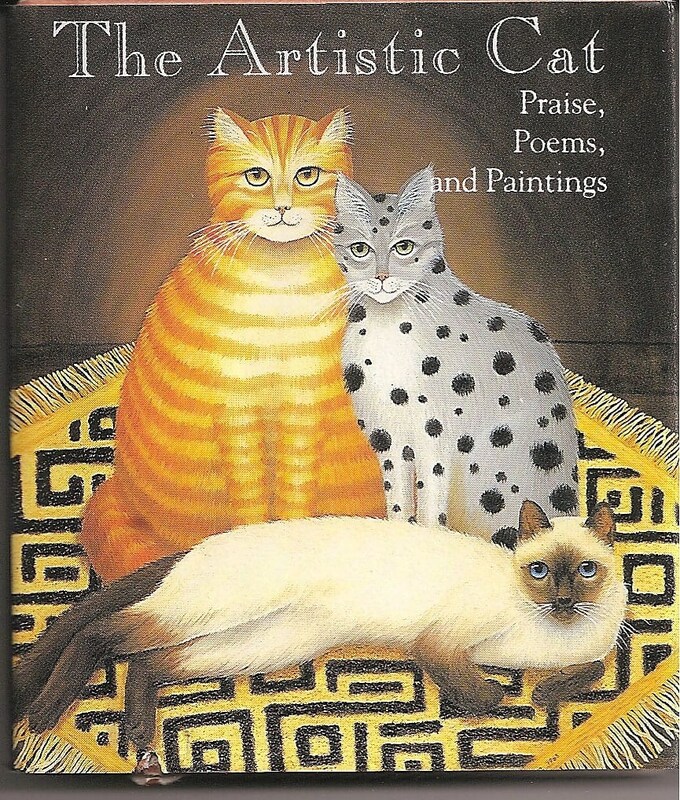 According to the cover, it states, “From their ticklish whisker-tips to their sensitive serpentine tails, cats are masterpieces of line and proportion.” That definitely is coming from an artist’s point of view. The rendition of Janet Thorndike’s Coven of Cats with the cats gathers in front of a sunset with sunflowers is just one example of the beautiful artwork. 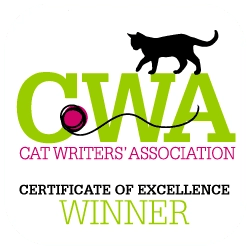 In the introduction, it states that cats, defy explanation. Their curves don’t follow the rules of Euclid’s geometry, and their movements are a test to Newton’s laws of rest and motion including the laws of gravity. This book can be ordered from the publisher for a fee. For more info, contact Running Press Book Publishers, 125 South Twenty-second Street, Philadelphia, Pa., 19103. The only thing better, a larger version to highlight all the wonderful artwork. Have you come across a book that you’d call a diamond in the rough? Do you have some old favorites that you’d like Paws to reflect upon? If so, please share. Thanks. I’m flattered from someone at the Huffington Post. You have a great site. What’s up, for all time i used to check webpage posts here early in the daylight, because i enjoy to learn more and more. Try to write informative and entertaining post involving cats. Glad to have you visit. There’s alot more to come over the next few months. quality writing and content, both educational and entertaining to readers. 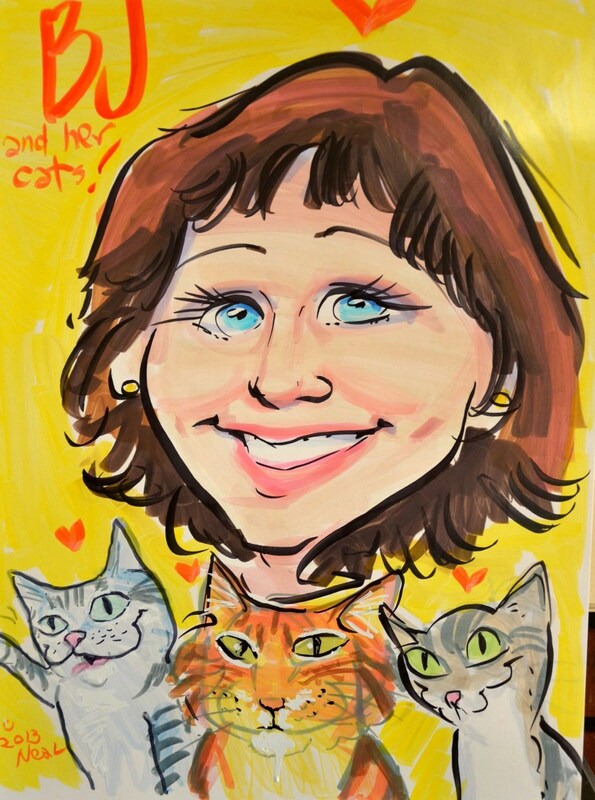 We also try to focus on how kitties and humans connect, on all levels. Please keep stopping by. We appreciate your feedback. to put this article together. I once again find myself personally spending a significant amount of time both reading and commenting. Thanks for your kind comments. We all need to stand together to help out our fellow felines, who desperately need our help. Useful information. Lucky me I found your site unintentionally, and I’m shocked why this accident didn’t happened in advance! I bookmarked it. Hello my friend! I wish to say that this post is amazing, great written and come with almost all significant infos. I’d like to see extra posts like this . Hello, after reading this awesome article i am also happy to share my knowledge here with friends. We stumbled over here by a different page and thought I might check things out. I like what I see so now i’m following you. Look forward to looking over your web page repeatedly. I will right away seize your rss feed as I can not to find your e-mail subscription hyperlink or e-newsletter service. Do you’ve any? Please permit me understand in order that I may subscribe. Thanks. Wow! In the end I got a webpage from where I be able to actually take valuable facts concerning my study and knowledge. Another small-format artistic book on cats is In the Company of Cats: A Tribute to the Feline, 1991, a handsomely produced book of (mostly) photos , all accompanied by quotations (from single sentences to three pages) by famous people, particularly, authors. Thanks for sharing. I’ll have to check this out. 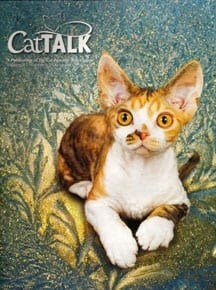 I was cat-tivated by the images of the cats on the cover. Really very nice. Your nephew has an eye for a gem, indeed. What a great book review! It sounds like a lovely book and would make such a meanigful gift. I love painting cats – their eyes have so much depth and color, their coats so much softness, their bodies such elegance.